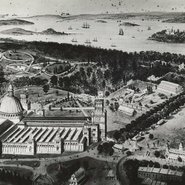 The early history of the Art Gallery of NSW is complex: the collection began before there was a building to house it and exhibitions and programs were delivered even before the Gallery began collecting art. The story of the founding of the Gallery is a characteristically Sydney one, full of intrigue, opportunism and idealism. Some of the most characterful personalities in the colony clashed over where the Gallery should be located, what it should collect and how it should be organised. Steven Miller, head of the Gallery’s research library and archive, will trace the history of the Gallery until its establishment on the present site in the Domain.